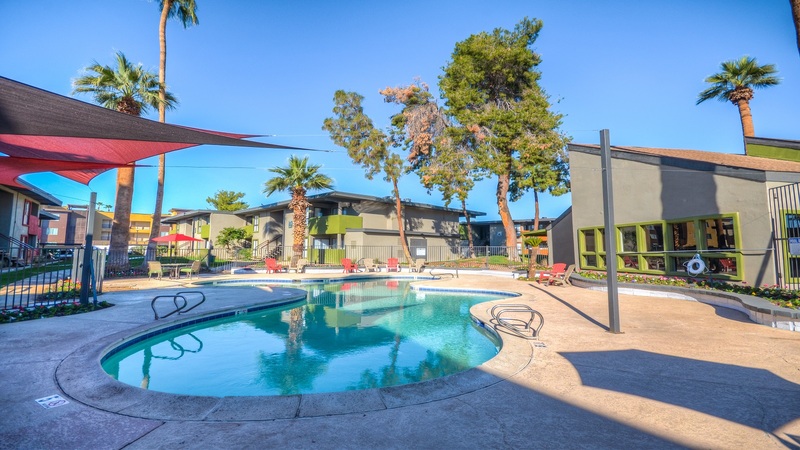 Phoenix, AZ – July 13, 2018 – ABI Multifamily, the Western US’s leading multifamily brokerage and advisory services firm, is pleased to announce the $9,500,000 / $102,151 Per Unit sale of The Vue on Camelback located in Phoenix, Arizona. Originally built in 1974 and intensely renovated in 2017/18, The Vue on Camelback is a two story, garden-style apartment community that features 93 total units in 6 rental buildings constructed of wood frame and stucco. The property has flat roofs and rests on approximately 2.62-acres. The unit mix consists of 48 one-bedroom / one-bathroom units measuring approximately 530 square feet, 44 two-bedroom / one-bathroom units measuring approximately 730, and 1 two-bedroom / one-bath unit measuring approximately 930 square feet, with a weighted average size of 629 square feet. Electricity, gas, and water are all mastered metered and reimbursed by tenants through a flat rate. Hot water for the property is provided by master boilers and HVAC is individual roof-mounted. Units feature air conditioning / heating, ceiling fans, outside storage, patio / balcony, and kitchens equipped with dishwasher, range / oven, and refrigerator. The community also provides its residents with a swimming pool, clubhouse, and laundry facility. "The Vue on Camelback is centrally located along the Camelback corridor near Grand Canyon University and Christown Spectrum Mall and walking distance to the light rail," states Alon Shnitzer, Senior Managing Partner at ABI, along with Rue Bax, Senior Managing Partner, who represented both the buyer and the seller in the transaction. "The property was acquired by the selling entity 2015 and went through an intensive renovation inside and out. They brought the property back to life with the beautiful renovations and modern touches," states Rue Bax. The buyer is a private investor with offices in Phoenix, AZ and Canada. The seller is a private investment partnership based in Phoenix, AZ. The multifamily brokerage team of Rue Bax, Alon Shnitzer, John Kobierowski, Doug Lazovick and Eddie Chang represented both the buyer and seller in this transaction.